You’ve probably witnessed the sight in your travels. You’re cruising down the highway and you catch a glance at the driver next to you; instead of their hands on the wheel and eyes on the road, they are typing away on their cell phone. Or better yet, they are applying their makeup or shoving a sandwich in their mouth. It’s called distracted driving and it’s dangerous. One split second of not paying attention to the road can change your life and the lives of those around you. It’s imperative to understand what distracted driving is, how you can manage it and what the consequences are when you get behind the wheel. The National Highway Traffic Safety Administration (NHTSA) indicates that texting is the most alarming distraction for drivers. Sending or reading a text takes your eyes off the road for 5 seconds. At 55 mph, that’s like driving the length of an entire football field with your eyes closed! 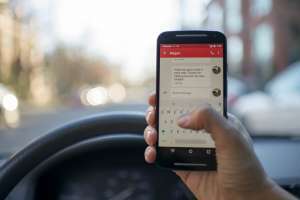 While almost half of high school students surveyed reported having sent a text while driving in the past 30 days, it’s a problem that is reaching epidemic proportions for all age groups. Nowadays cars are designed to let us be connected to the world around us, but we must remember that when we get behind the wheel our obligation is singular in nature–to just drive. It’s easy to be distracted when driving; the phone rings, your favorite song comes on or you get into a heated debate about the Red Sox. However, there are some easy steps you can take to manage driver distractions. Turn it off. Turn your phone off or switch to silent mode before you get in the car. Or better yet, put the phone away in a place it cannot be accessed while driving. Pull over if you need to make an urgent call. Most phones nowadays have a Bluetooth feature that allows for hands–free driving. X the text. Don’t ever text and drive, surf the web or read email while driving. It is dangerous and against the law in most states. Start your GPS or review maps and directions before you start to drive. If you need help when you are on the road, ask a passenger to help or pull over to a safe location. Secure your pets. Pets can be a big distraction in the car. Always secure them properly before you start to drive. Keep the kids safe. Pull over to a safe location to address situations with your children, rather than trying to handle it while driving. Focus on the task at hand. When you get behind the wheel, you are obligated to make safe driving your one and only priority. Everything else can wait. Did you know that distracted driving is against the law? Each state’s legislature and governor make the laws regarding distracted driving. Many states now have laws against texting, talking on a cell phone and other distractions while driving. These laws carry hefty penalties and can result in having your license suspended, or even revoked, for repeat offenders. As of June 2017, texting while driving has been banned from 46 states and the District of Columbia. If you are pulled over for distracted driving, be prepared for the consequences. If you’re “lucky,” it might only be a fine and the headache of rising insurance costs. Or, you might end up dealing with the heartbreak of an accident that could have devastating implications for you or the other driver. The Dowd Insurance Agencies wants to ensure you are safe on the road. Just as it is our duty to protect you with the peace of mind that comes from an auto insurance plan, it is your duty to not let distracted driving get in your way. Call us today to make sure you have the right protection.